I don’t see any wisdom teeth in there. Maybe this is one of those lucky kids who doesn’t have them. 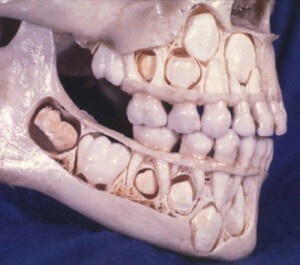 But I can easily see why third molars tend to come in impacted. This entry was posted in Science and tagged biology, skeleton by Chris Riley. Bookmark the permalink.